It was my turn this week to set the theme on SALT. Prayer is the life line of a Christian, the powerhouse of the church, essential to growing in faith and relationship with the Lord. 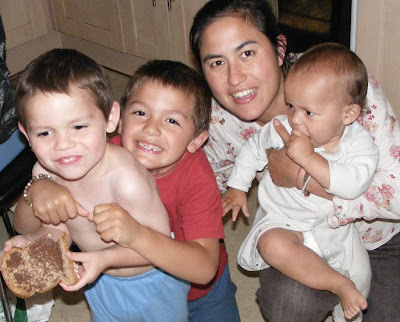 As a busy mum it is easy to get through the day and have not bended my knee in prayer to the Lord. Throwing up prayers whilst washing up or walking to school sometimes has to be my lifeline and one aspect of praying continually. However I think this verse implies more, that we are not to give up praying. It's not a one off act, it should be part of every day of the rest of our lives. Please make a project that might help you to pray or be a response to meditating on this theme. Here is what I made, it's intended to be a prayer diary, it has 14 pages with the days of the week written at the top of each page. 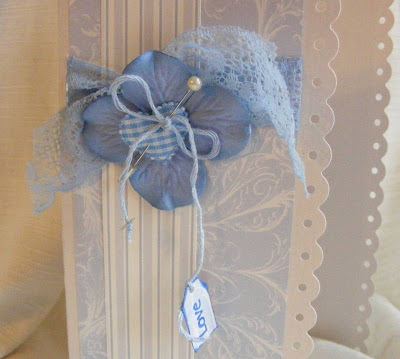 Paper by Deja Views, Martha Stewart doily lace punch, square scallop punch, Bind it all, lace, ribbon, flower and charm from stash. Had a couple of commissions this week. Was inspired by the sketch on 2sketches4you, it was just perfect! I really enjoyed making this with all the little details. Thanks for all the lovely comments you have left, I really enjoy reading them, and I do try my best to visit your blogs. 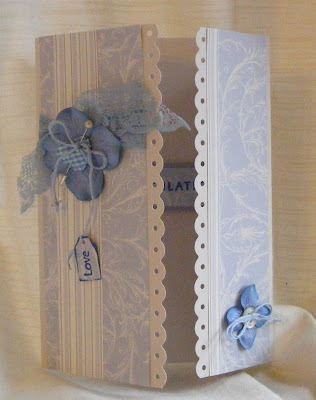 Paper by Anna Griffin, Prima flowers, stamps by Hero Arts and Hampton Art, Fiskars threading water punch, Xcut label punch, lace, thread, sequin, pearl pin and gingham heart from stash. 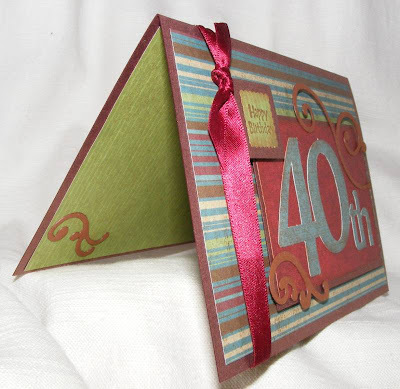 The same client wanted a man's fortieth card. 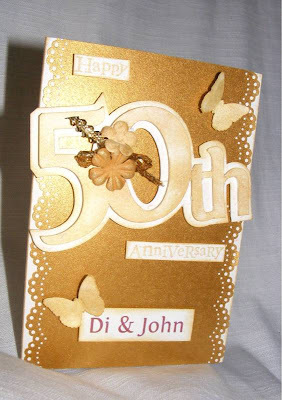 I was a bit stumped for a bit, but using the Craft Robo helped for the big `40th'. Decorated the inside to make it extra special, and used some Quickutz swirls my sister had sent me last week, thanks est! 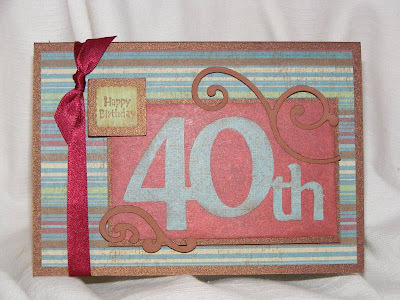 Paper by HOTP, stamp by Hero Arts, 40th cut by Craft Robo, Quickutz scrolls, ribbon from stash. 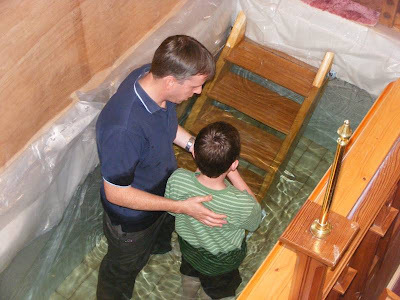 We had the pleasure and the privledge of seeing Tom's nephew get baptised this weekend. We had a lovely time with my sister inlaw and her family. The children got on really well on the whole. The church we were in was tiny and slightly claustrophobic because of the balcony on the three sides of the hall. It was really quaint, but gave us a great view of the baptistry! He had to tell the congregation how and when he became a Christian and why he was being baptised and 3 other girls were baptised with him. It was one of my friends birthday today, made her some scones and took some strawberries and cream round this afternoon. Here is the card I made using the CPS sketch this week. 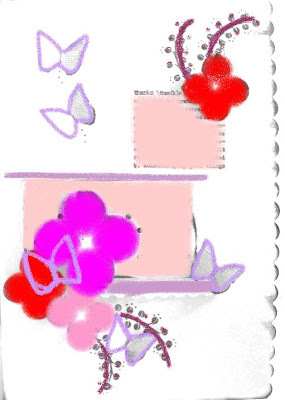 Ingredients: PP by Diane's Daughters, tag by K&Co, Martha Stewart butterfly punch, Rhonna Farrer stamp, flowers and ribbon from stash. 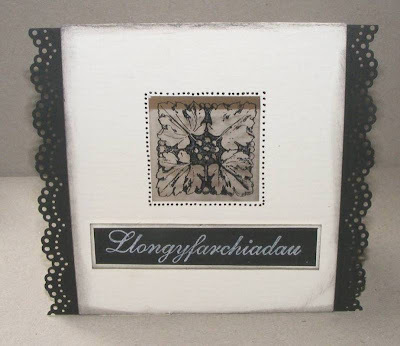 PP by TLC and Anna Griffin, Stamps by Lavinia stamps, Anna Griffin and Rubber Stamp Tapestry. 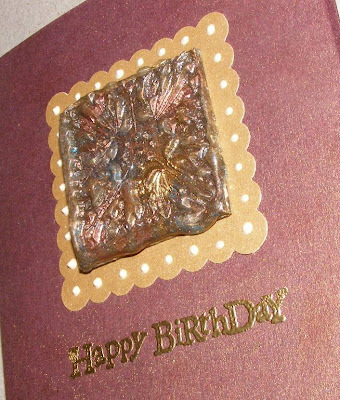 A lovely baby girl card for friends who had one last night. Aparantly the paramedics got there just as shoulders were emerging! This card was going to be more detailed, but it looked too cluttered, so here is a simpler version, what do you think? 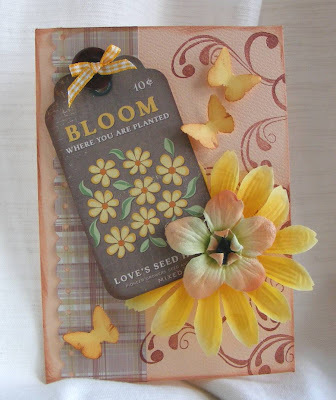 Stamps by Hero Arts and Stampin Up!, Gingham ribbon, circle and scallop punch. I can finally reveal the pictures of the recent album I made for a friend of mine. She phoned me a few weeks ago to ask if I had any ideas for something for her son's birthday. he runs a backpacking hostel in Argentina and has been out there a year. She wanted something that could commemorate his business and more... We discussed it, she brought pictures round and we chatted about her son and what he was like etc. 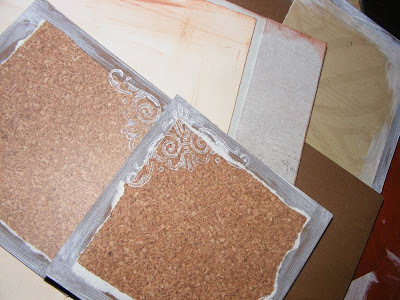 Anyway, after an enjoyable process including her bringing round an old pair of jeans and a piece of a rope ladder he climbed as a child to her going thought my scrapbook papers and choosing colours and textures she liked, I then set to work on the album. I knew I wanted to use my bind-it-all, and as agreed create a calender style album that did not have months or dates written in so he could choose to fill in retrospectively or for the future. work on Carole Janson's blog inspired me for this. I also knew I wanted it to be textured, not to neat, I love Donna Downey's work with fabric albums, and had shown my friend Donna's website. Incidently she loved all the colour of Donna's work but we didn't think they would be appropriate for her son. Anyway, enough chat, to the pictures... I have some more detailed pictures of hidden flaps and quotations. Please leave a message if you would be interested in seeing these and also if you'd like to commission me to make something for you! PP by Basic Grey, HOTP, Sandylion, TLC and maybe others. 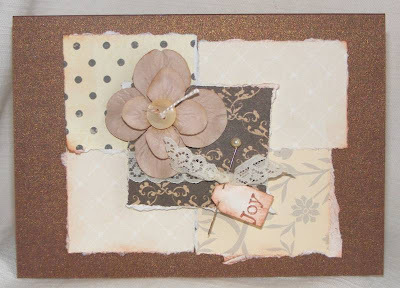 Cardstock by TLC. 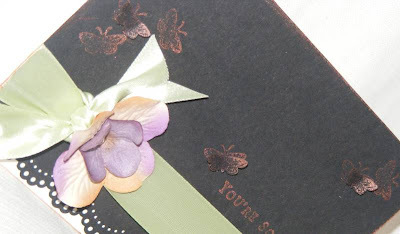 Bind-it-all, various punches, stamps by All Night Media, Hero Arts, Clever cut and others. Paint by Adirondack. Stamps by Inkadinkado, Martha Stewart doily and butterfly punch, number cut by Craft Robo, Prima flowers and ribbon from stash. 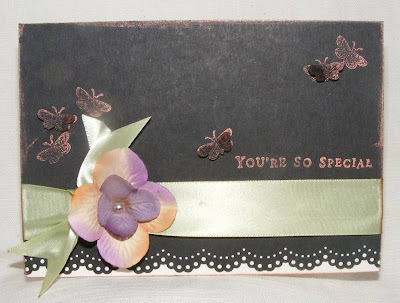 The challenge was to use black as a background for a card. Stamp by unknown, Martha Stweart Doily Lace punch, ribbon, eyelets, pin and heart sequin from stash. Couldn't remember if I've posted this pic before, I had a play with it in Corel Photo Paint, I'm much happier with the colour of it now. An album for a son of a friend. Here's a sneak peak, sorry can't show you more til he has received it! I cut the little window with my trusty metal ruler and knife and stuck the stamped recycled toy packaging behind it. I love the black punched out lace. 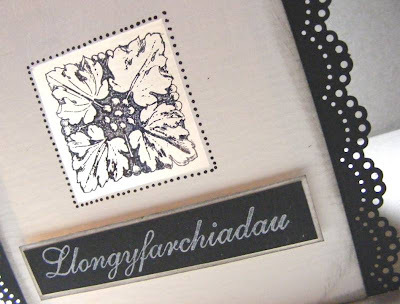 The word is CONGRATULATIONS in Welsh. It's been ages since I got out the UTEE, its fab stuff, bit unpredictable, but thats the fun of it. Thanks to DCM this week they inspired me to have a play. Made this card with one of the pieces, got two others that I'll be using on a commissioned album I'm making, will share pics when its done and been given to the recipient. 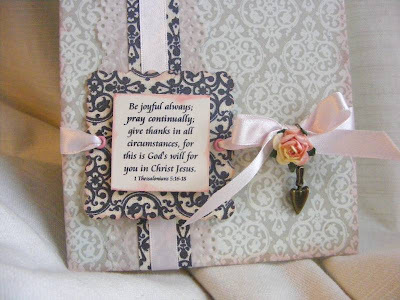 The other card I made as I was desperate to have a go with my new Martha Stewart doily lace edge punch. Especially as I had to pay over £12 in customs for two of them - in addition to the already high price! Next time I'll ask the seller to send things seperately, actually, next time I'll buy them direct from Martha's website before they get sold out! 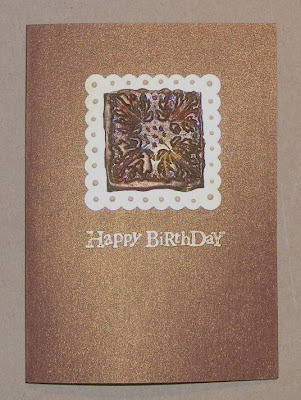 UTEE and embossing powder.Stamps by Inkadinkado and Rubber Stampede. 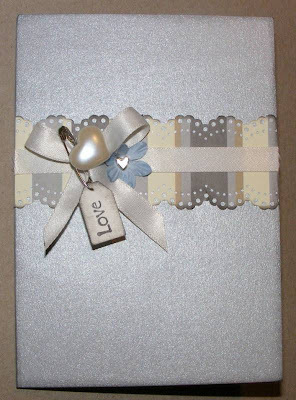 Pebeo Pearl Touch and scallop square punch. 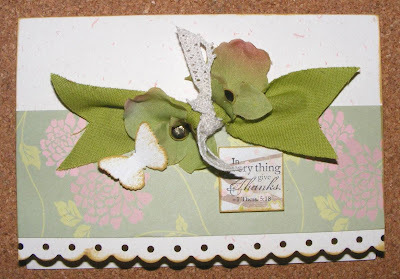 Paoer by Laura Ashley, Prima Flower, stamp by Hero Arts, Martha Stewart and X cut punch, ribbon, pin, button and brad from stash. Made this card for a friend, and thought I'd make a sketch out of it. It's on the right if you would like to save it. Please use it - card or layout, choose your favourite products, but please try and stick as closely as you can to the placements of the elements, you can however turn it. I'll come over and comment, and collate all the pictures on here next week. You have until the evening of Tuesday 10th September. 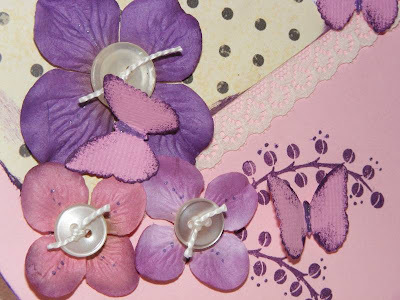 PP by Brenda Walton, flowers by Prima, stamp by Anitas, Sakura glitter pen, punches by Martha Stewart and Fiskars, buttons, lace and thread from stash. CPS no 80 - Which one will you choose? Well this looks similar to CPS sketch no 19 . I have to confess I made the card then found the sketch to fit! 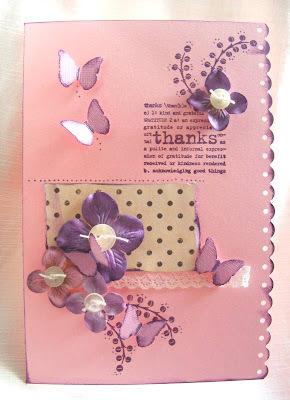 Loving my new Fiskars Threading water punch, it seems to just finish cards beautifully. Especially when it looks like it just needs that something else. 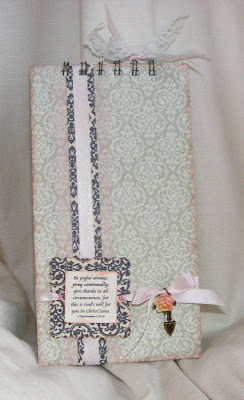 PP by Laura Ashley and Basic Grey, Stamp by Stampin Up!, ribbon, lace, brad and flowers from stash. Butterfly punch by Martha Stewart, scallop punch by Fiskars.